the world is mine: First look at new Ferrari! Ferrari says the California "is aimed at owners who desire a car which embodies everything the Prancing Horse represents in terms of sporty design and innovation, but also seek a car with greater versatility than ever." This newest prancing horse is not the "baby Ferrari." It is, in fact, a brand-new model complementing and similar in size to the racier F430 with more flexibility in packaging. In addition to having a retractable hardtop, the car can be ordered in a 2+2 configuration - children seating only, please!, or more storage space for weekend outings. There is even a trunk pass-through for skis for those who want to hit the slopes in the winter. And despite a raft of new technologies, the California doesn't forget Ferrari's past. The car's styling uses several nostalgic elements from the Ferrari 250 GT California Spyder from the late 1950s and early 1960s. Those elements include the large air intake on the hood, the side gills just aft of the front wheels, near identical grillework and similarly swoopy rear fenders. And although the photos Ferrari released to the world's press don't do the car justice, Editor-in-Chief Thos L. Bryant — who recently got a sneak peek at the car at the Ferrari factory — says the California "looks absolutely stunning in person." Unlike the Ferrari Superamerica from a few years back, which featured a roof that simply flipped backward, the California will come only as a true retractable hardtop; meaning, when the top is down, the rear deck is completely flat — just like the Mercedes-Benz SL, for example. Editor Bryant was also fortunate to see the top in action, and he said it was "quite slick in its operation." The factory claims it takes 14 seconds to go from open top to fully-closed position. As with any Ferrari, the engine is the star of the show. In this case it's a 4.3-liter direct-injected flat-crank V-8 that produces 460 bhp. Even more important is the car's use of Ferrari's first dual-clutch gearbox with not six speeds, as on every other recent Ferrari, but seven forward gears. 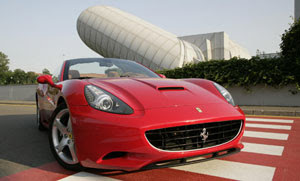 Ferrari claims the California will be able to hit 100 km/h (62 mph) in less than 4 seconds. In another dramatic move, Ferrari has swapped out its traditional double-wishbone suspension at the rear for a multilink setup on the California. And those amazing (and incredibly expensive, lightweight and fade-resistant) Brembo carbon-ceramic brake discs seen on so many Ferraris these days? Standard issue on the California. In yet another new move, Ferrari has been unveiling the California bit by bit online on a special website — www.ferrarigtcountdown.com. The first piece released was the sound of the car's V-8, followed days later by three photographs. More photos and information about the car will continue to be posted in the coming weeks (Ferrari calls it a "virtual voyage of discovery"), right up until the California's official worldwide reveal at the Paris auto show on October 1. 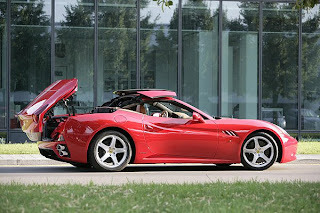 Ferrari says the California will start production in late summer in a brand-new building in Maranello. Fans should see them on sale in Europe by the end of the year, with U.S. sales following later, probably as a 2009 model and priced in the range of the F430.